A panoply of health hazards in an overburdened city. My wife and I were both excited and prepared for difficulties — insistent beggars, endemic dengue and summertime temperatures that reach 120 degrees. But we had little inkling just how dangerous this city would be for our boys. 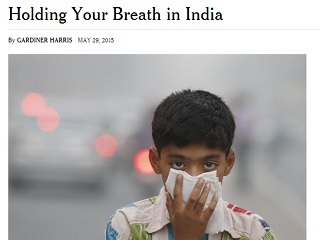 Harris leads with a harrowing, middle-of-the-night anecdote and goes on to note that Delhi’s air quality is far worse than Beijing’s. He also writes that so many American families are choosing to leave the Indian city these days that it is severely affecting the enrollment rolls of the American Embassy School. Living in the Indian capital, as many others will tell you, is a punishment best avoided. If you have the option, if you can find employment and happiness in some other city, if you love your children more than the job, stay away from Delhi.